The bioprinters are robotic devices, which enable 3D bioprinting. 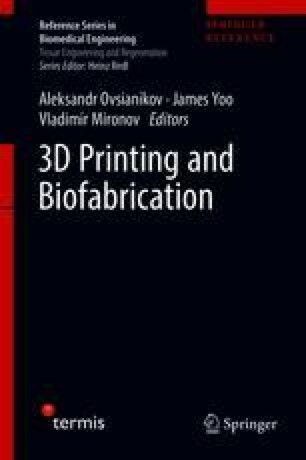 In this chapter, we provide classification of already existing commercially available 3D bioprinters and outline basic principles of their construction and functionalities. The emerging trends in the design and development of 3D bioprinters, perspectives of creation of new types of commercial 3D bioprinters based on new physical principles, including in situ bioprinters, as well as completely integrated organ biofabrication lines or “human organ factories” will be also discussed.